Movie Review: “The Lunchbox” is a generous drama about life and its problems, presented in a light and sporadically funny atmosphere of a long-distance romance, and marking a promising debut by Ritesh Batra on direction. Ila is going through a big crisis in her marriage, passing her days alone and only speaking through the window, to an elderly aunt who lives right above her flat. Every day she makes a lunchbox that a carrier was supposed to deliver at her husband’s office, but instead he was delivering at a wrong address and the beneficiary was Saajan, a solitary and taciturn widower who is about to retire and lives unhappy since his wife died. Both of them start a strange correspondence by letter (hidden inside the lunchbox) where they speak about their lives and concerns, making them better tolerate the difficult situations they were going through – she didn’t feel so lonely and anguished, while he became more cheerful and open at work, helping his future substitute, Sheikh, a friendly and smiling orphan who turned out to be his friend. I took some time to really enter in this letter game, but the more the film moved forward, the more I got involved, becoming curious about what these two common and grieving souls had to say. 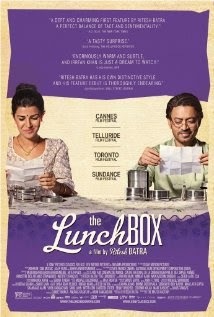 Even though, I expected some more from “The Lunchbox”, which being unable to utterly enchant or shake my emotions in its plenitude, certainly did it with my stomach, every time I imagined the smell and taste of Indian food. Simple, warm, and direct, it leaves us with an open ending and provides us with a few pensive reflections on life.